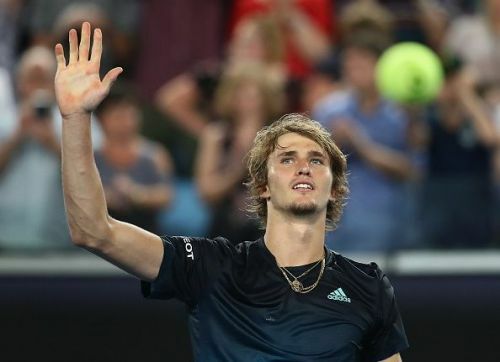 The young German Alexander Zverev is tipped by many to be a future Grand Slam champion. I don’t disagree with this notion, but I believe he is yet to adapt to the best of five sets format. There is evidence to prove this. Last year at the Australian Open was when I first realised that the best of five set format is Zverev’s Achilles' heel. He was beaten in the fourth round by South Korea’s Hyeon Chung, which was considered a massive shock. Zverev then toiled at the French Open, being forced to go to five sets by Dusan Lajovic, followed by Damir Džumhur and Karen Khachanov. Although he made a maiden Grand Slam quarter-final, his struggles against players he was heavily favoured raised questions about why he kept disappointing on the bigger stages. Whether it’s his concentration or endurance or simply his preference for shorter matches, it is difficult to know. The exact same story happened at Wimbledon as Zverev nearly crashed out early to American Taylor Fritz in the second round before being stunned by Latvia’s Ernest Gulbis, who was outside the top 100. At the US Open last year he lost in the third round to German Philipp Kohlschreiber, a player Zverev was highly fancied to beat. Will the 2019 Australian Open be different? Yesterday night’s match against Jeremy Chardy, when the Frenchman was up in the third set, I could almost tell it was a case of the same old story. Zverev survived in five sets, barely, but he could so easily have lost that match. Next up is the young Australian Alex Bolt which on paper, Zverev should win easily. Except with Zverev, it's never simple. Personally, I can’t see him getting to the semi-finals although as a number four seed he really should be going further than he has. What about the other three Grand Slams? Zverev may know how to dominate the best of three sets format and win Masters 1000s, but he has failed to deliver at the Grand Slams. In winning the ATP Finals last year, Zverev showed his astounding talent as he overcame both Federer and Djokovic back to back. But we haven’t yet seen this tennis from Zverev at the Grand Slams. Since he is still only 21 years old, I think it will take him slightly longer than we expect for him to figure it out. Near the end of the 2018 season, tennis legend Ivan Lendl joined Alexander Zverev's coaching team. It is said that Lendl was crucial in masterminding Zverev’s victories against Federer and Djokovic at the ATP Finals. Of course, the Czech’s knowledge will be invaluable going forward. However, I think they will need this season as a transition and a learning curve to base success upon for next year. Will 2020 bring his first Grand Slam? Zverev won the Italian Open and Montreal Masters in 2017, followed by the Madrid Masters last year. I wouldn’t be surprised if he adds to his Masters collection this year, maybe winning one of Indian Wells and Miami or another claycourt Masters. By Wimbledon next year, Zverev will be 23 years old. I'm willing to bet he would have accumulated enough experience by then to be in contention for his maiden Grand Slam. Meanwhile the Olympics, played in a best-of-three format, again plays to his strengths. It is Zverev's desire to win and be the best that makes him the best young player equipped to challenge the top four. But Zverev has work to do if he is to convince his doubters.